AirShield2 | 802 Secure, Inc. The 80% of edge computing is wirelessly enabled today across devices, networks, and IoT. This evolution requires a new level of visibility across not only the IT network, but the surrounding Physical environment (off-network systems). Gartner and NIST refer to this as Cyber Physical Security. The lack of Physical visibility, management, and security exposes organizations to risks including unmanaged, Shadow IoT, and adversarial devices such as wireless thermostats, Smart TVs, spy cameras, drones, rogue cell towers, wireless storage devices, and much more. 802 Secure’s AirShield is an autonomous and non-intrusive wireless monitoring solution that provides immediate visibility and protection across the Cyber Physical space. 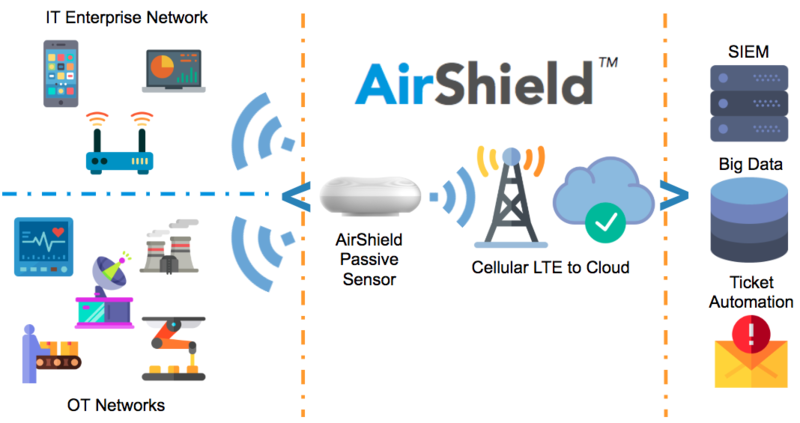 AirShield provides scans across multiple wireless protocols and frequencies to detect wireless devices and networks and protect against misconfigurations, Shadow IoT, unknown and unmanaged IoT devices, and previously undetected adversarial attacks. This is accomplished using wireless deep packet inspection, situational awareness, zero trust security, anomaly detection, machine learning, and behavioral analysis.